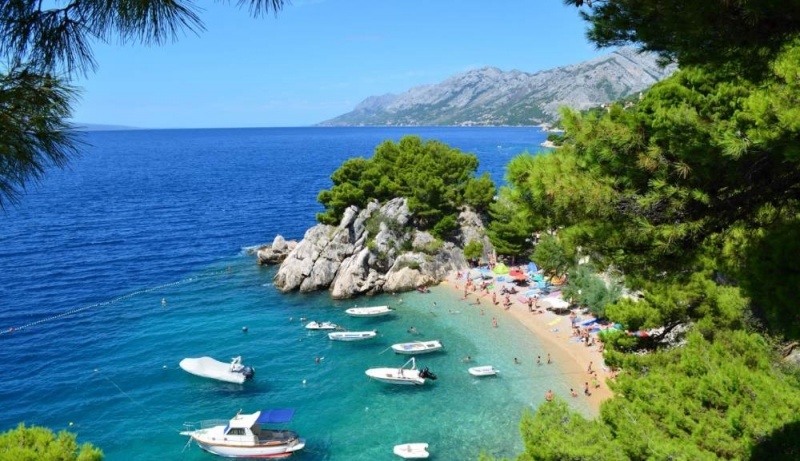 The Makarska Riviera extends over a length of 53 kilometers from Brela in the north to Gradac in the south. 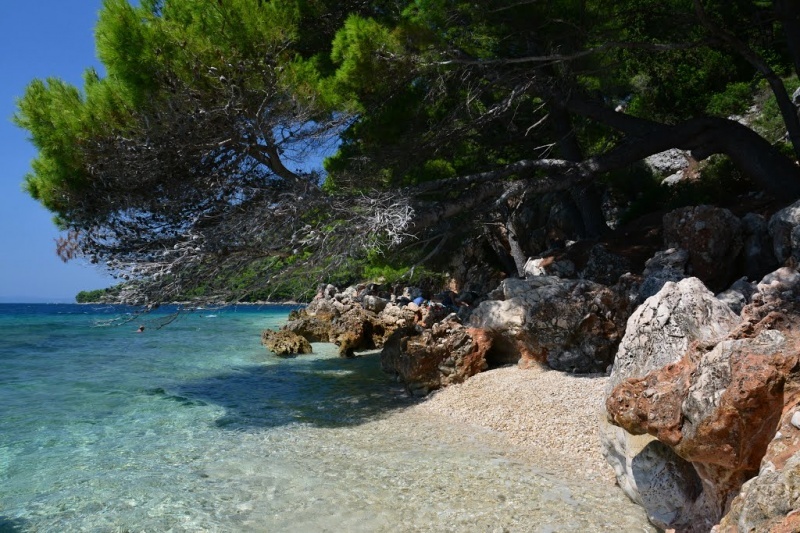 It is special on the Croatian coastal strip, mostly due to the beautiful beaches and of course the rich tourist offer. It is located below the mountain Biokovo. Decorated with blue colors of the Adriatic Sea on one side and seemingly rocks on the other side. Still, the steep and rocky slopes are rich with pine forests, which is also felt by the scent that is special for that part of Croatia. 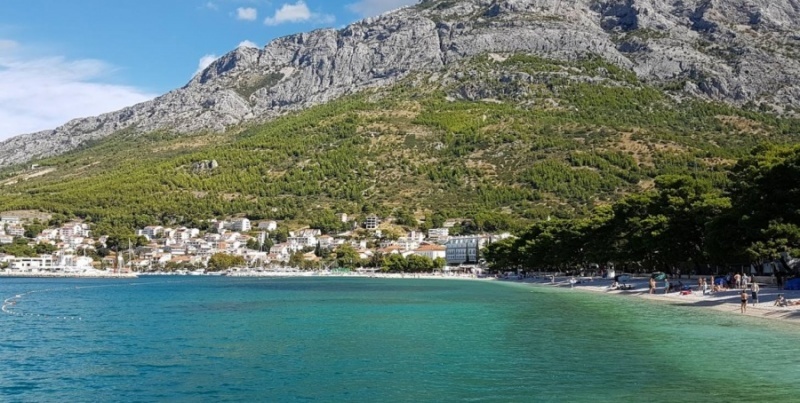 The Makarska Riviera includes the municipalities of Brela, Baska Voda, Tucepi, Podgorica and Gradac, and the center is of course the city of Makarska. The whole climate is felt throughout. Hot and dry summers, and mild winters with a large number of rainy days, are characteristic of the Makarska Riviera. In the year we can count over 2,700 sunny hours, which is why the tourist season is extremely rich and lasts a little longer than it is in the northern parts of our coast. The annual average sea temperature is higher than 20 degrees Celsius, and in the summer it is between 23 and 27 degrees. 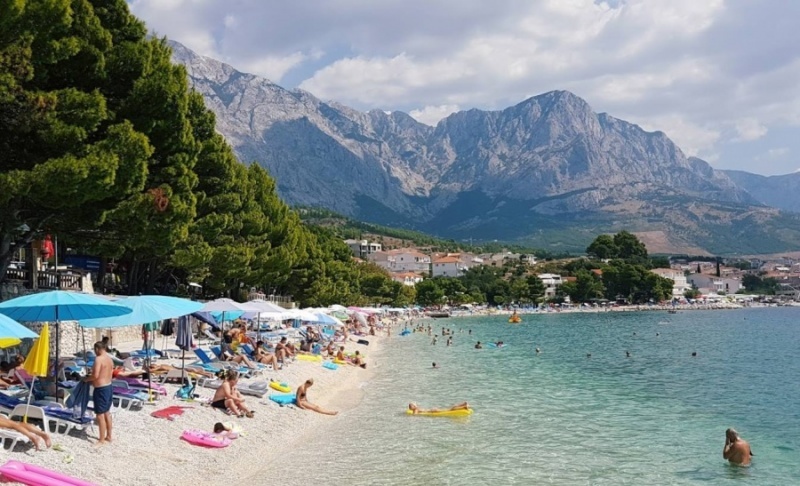 There are numbers that tell us that the Makarska Riviera is among the hottest parts of Croatia. It stretches over 50 kilometers along the coast, and is special for really enchanting pebble beaches. 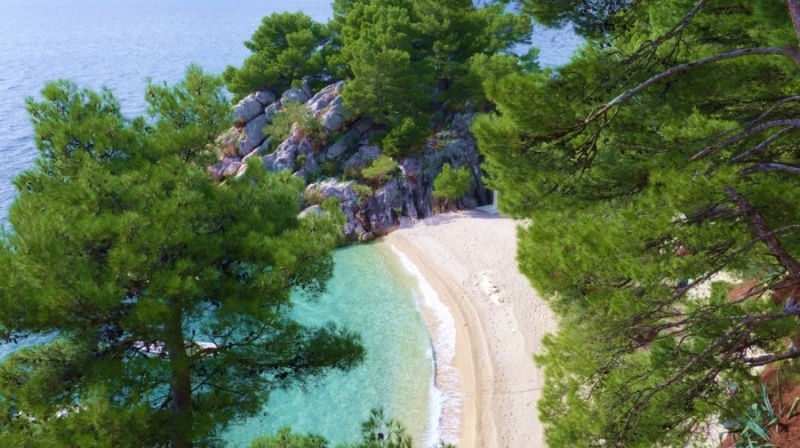 Most beaches are decorated with dense pine trees, and of course the pure colors of the Adriatic Sea. Makarani are also proud of their rich cultural heritage, which they skillfully present to their guests during the summer season. Numerous cultural and entertainment events are held in the mentioned places. Guests like it and especially the prices. However, on this occasion we will mention the beaches so we can go. Ovu plažu opisuju kao skrivenu i romantičnu. Iako se do nje može doći pješice, to je zahtjevno pa savjetujemo samo onim dovoljno spretnima Strme cliffs stretching the way to the beach are not suitable for all guests. Because of this, most of the time here are the sailors who love their yachts and enjoy the natural beauties surrounding the beach. One part of the beach is reserved for naturists who want their freedom and peace. Hidden from curious views, here they can relax and enjoy the way they love. Above the beach there are tall pine trees that will give the required shade during the strongest sun. Here you can spend all day, protecting yourself with a sunscreen and escaping into the shade during the strongest sun. The sea is special, crystal clear and shade cooler than the average. The reason for this is the many fresh water sources nearby. You will not see them, but here and there are some lower sea temperatures. The beach is pebble, in a natural setting enclosed by steep cliffs. If you are looking for a romantic holiday destination, we do not think there is any beauty from this beach. The Mala Duba Beach (pictures and locations) stretches across the entire population, is gravel and very accessible. It is especially good for family vacations, for parents traveling with children. Due to the fact that it is located in the village itself, the beach is easily reached by foot or by car. However, parking is payable unless you are in one of the nearby apartments. The number of accommodation is sufficient but is still full during the season. If you want to seize your place we suggest you book it on time. Catering facilities follow the beach. They are located along a promenade that is a favorite place for many, especially in the evening when the sun sets. A part of the beach, somewhat separated from the rest, is reserved for nudists. This would mean that there is room here for everyone, and all guests are welcome. 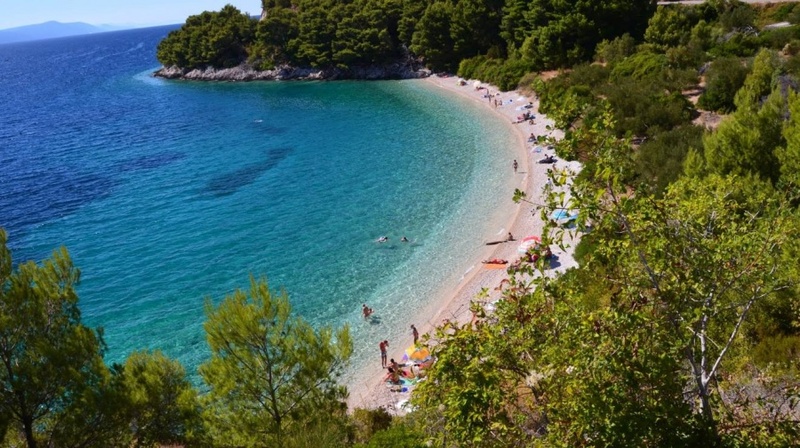 If you are looking for a destination for the next summer vacation, consider this beautiful beach in Živogošće. Velika Duba Beach (pictures and locations) or as some others call Dubai is located in the uninhabited area and leads to the beach a long sandy trail that starts in Živogošće Blato. On the beach during the season, the beach bar is open as one of the most beautiful on the Makarska riviera. The beach is hidden in a pine forest so shade is provided for all guests who want to hide from the sun. 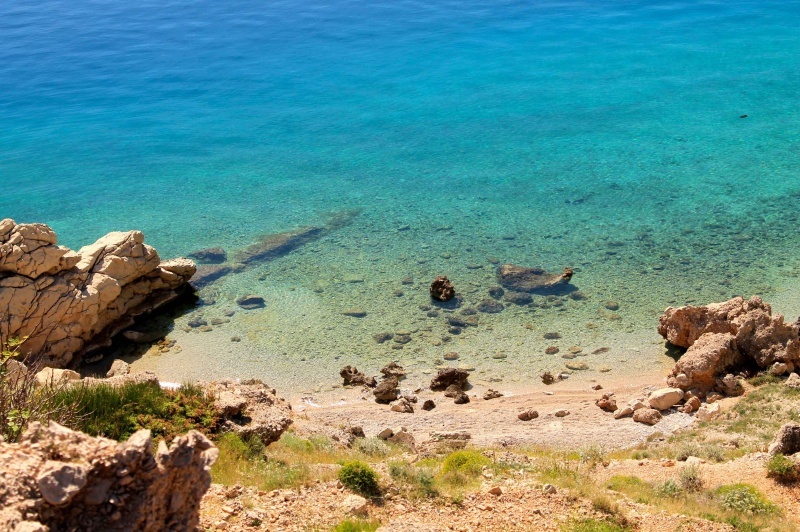 is located between Makarska and Tucepi. 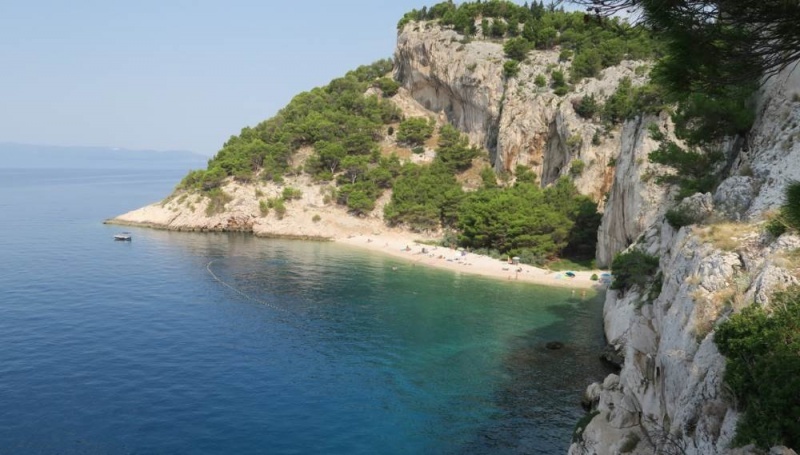 One of the most famous nudist beaches of Makarska Riviera, especially because of its beauty and the surrounding nature. It is a pebble beach, hidden among the rocks that overgrown with pine trees. The sea that touches the beach is pleasantly warm, pure and beautiful blue. You can reach the beach by foot, descending on a small trail through a shady forest or by boat. Here you can find your private corner and relax. It is also possible to take a day's rest, even during the strongest sunshine, because you can hide in a forest that overhangs the beach. On the side of the beach is bordered by high rocks that give it a special beauty. The beach reminds of the hidden oasis, which in some ways is. 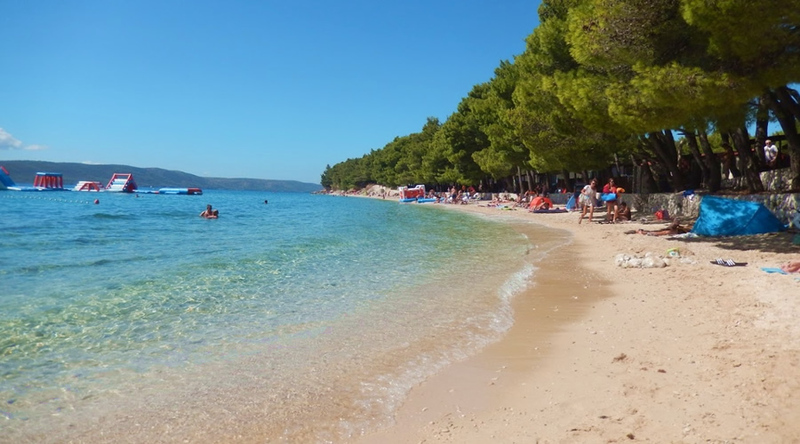 If you are staying in Makarska or Tučepi, and you love sunbathing, visit this beautiful beach. (pictures and locations) is located under the same road in Brela. It is a long and very popular beach. It is a pebble beach, with mild access to the sea. It is one of the most famous beaches on this part of our coast. The beautiful pebble beach in Brela is among the 10 most beautiful in the world. A little place can be proud of such a title, so in a couple of sentences we'll describe the beach. Punta Rata (pictures and locations) is a pebble beach that in contact with the sea has a sandy ground. Surrounded by beautiful pine trees on one side and sea blue on the other. He is a proud owner of the Blue Flag, which means that the beach is extremely clean, well-decorated and well-equipped. The purity of the sea must be understood, but it should be mentioned. In the photo, you can best see the blue tones of the clear sea, and experience only if you visit Brela. 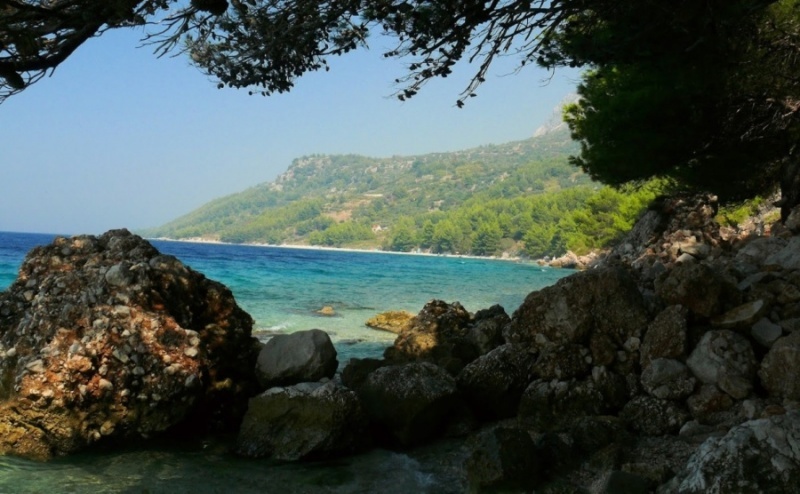 Gornja Vala is a pebble beach 5 kilometers long and located in Gradac. It is surrounded by pine forests, in some olive groves, which is especially good for relaxing in the shade. It is often visited by sailors because it is sheltered from winds, so it has a quiet sea. On the beach there is a restaurant with various dishes, and a couple of cafés offering a wide variety of refreshing drinks. If you are a sportsman, active and desirable, you can rent jet-ski on the beach. They are less volatile to play volleyball, while a large water slide for the sea is set for the younger. The beach is equipped with showers, changing cabins, and can be rented for sun loungers, sunshades or pedal boats. Glavna plaža u mjestu Baška Voda i jedna od najbolje opremljenih plaža na ovom dijelu Jadranske obale. Šljunčana plaža krasi obalni dio, dok se šljunak u plićaku brine o izmjenama plavih nijansi čistog mora. 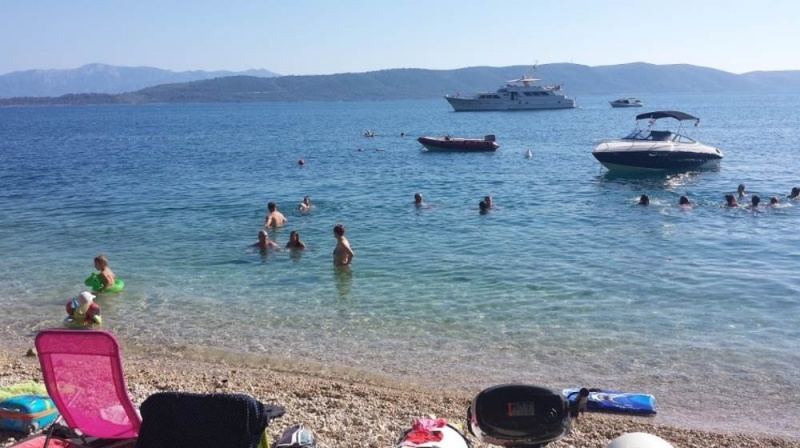 Najbolji kontrast fotografijama daje zelenilo borova, te veliki broj suncobrana na plaži. Veliki broj kafića i restorana daju bogatu ponudu, pa će svatko pronaći najbolje za sebe. Pored plaže imate dječje igralište, kao i razne sportske ponude za odrasle. Zabave vam neće nedostajati, kao ni odmora za one mirnije osobe. Ako ste za izležavanje, slobodno – ležaljki za iznajmit ima dovoljno. Just before entering Igrane, if you are driving from Drašnica, the beach of the Virgin can be stuck in the eye. However, the beach is not visible from the main road, but a small road passes through it, which connects these two places. This beach is insulated and suitable for those who do not want big crowds beside themselves. A few words for the end: If we crossed some of the beach it was not intentional. Simply, it is impossible to mention every one, which is why we look forward to your updates and new photos from your vacation. We hope you will enrich the published article with interesting photos and comments with them. Beach Kamp Dole Živogošće Blato - Outside the resort is an excellent positioned camp Dole. Part of the campsite will enchant many adventurers, especially because of the natural shade and the closeness of the sea. In addition, in front of the camp is the beach of the same name, spacious and very clean. The beach thrives on a pleasant warm sea. It is a pebble beach with shade in some places. The end of the beach is surrounded by natural rocks, giving a complete natural impression to this place. Our most common guests are couples with children, or friends who come to spend the most beautiful moments on our coast.